“The bank code ‘N’ is not approved for electronic payment. You must setup this bank code for electronic payment in ACH Interface Maintenance or select another bank code. This situation can arise because the customer has multiple bank accounts – some of which are used for ACH and others for pure check writing (no ACH). Vendors can be setup to have ACH through one bank account and checks through another. The solution occurs during the invoice payment selection (See below). 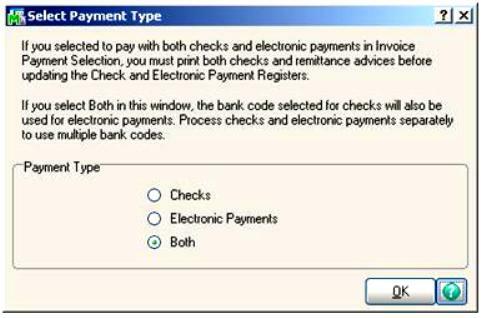 When you go intoCheck Printing and Electronic Payment to print the checks be sure to select “CHECKS” when asked how you want to pay. Don’t select “ACH” or “BOTH” or you’ll get the error message if the bank account is not approved for ACH. My friend and 90 Minds colleague Ed Wlodarczyk of Jacksonville Florida based Ennis, Pellum & Associates has a nice post that documents the steps users of Sage 100 ERP can take in order to send ACH electronic payments from within their accounting software. Increase your efficiencies, improve your cash management, reduce operating costs and lessen the risk of lost or stolen checks by paying vendors electronically using an ACH file created from the Accounts Payable module. Enable ACH electronic payments, define how they will be handled by your company, and the type of information that will be transmitted to your financial institution. You have the flexibility to select and set up one or more financial institution(s) for your electronic payments, and for each one you select, define the format and layout of the ACH file. The feature includes pre-note functionality, and flexibility in your electronic payment distribution, including options to allocate amounts between one or more accounts. ACH information on processed payments, historical information and vendors paid electronically is available on AP Reports. They can include auto checks, manual checks, voided checks, reversals, credit card transfers, electronic payments, wire transfer information in any combination. This enhancement was added to version 4.4 Product Update 2 as an incorporation of the prior Sage Extended Solution AP-1063. There is no additional cost to use the feature , including creating the transmission file, as it’s included as part of the base program. Sending electronic payments is a great timesaver for any company issuing many expense checks to remote employees and for situations where vendors request ACH payment. 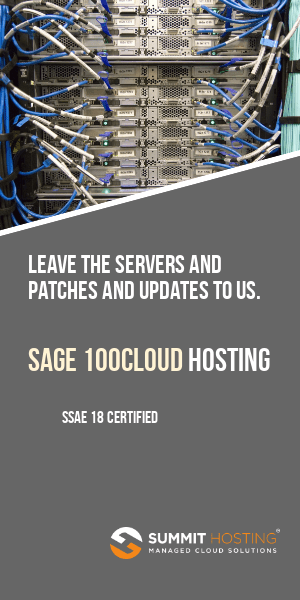 Sage just released a new Product Update #2 for Sage MAS 90 and MAS 200. In my opinion one of the top features in this update is the ability to pay accounts payable invoices electronically. Many times our clients have employee expense checks that are sent out weekly, bi-weekly, monthly or even a few times a week. The employees who receive those checks often are sometimes not in the office which requires the to be mailed. This introduces delays, increased postage cost and extra administrative time spent stuffing envelopes. Sure this may not be a big issue for those with two or three employees. Ramp the number of employees up to 100 or more — and suddenly you have a potential administrative time sink. The newest release of Sage MAS 90 and MAS 200 – which is available for download to those on the Basic Maintenance plan — adds ACH electronic processing. If you’ve used the Direct Deposit for Payroll – the ACH for accounts payable works nearly identically. Unlike older versions of ACH for Accounts Payable – this updated feature allows you to create your own customized export of data so that if a bank needs a feed adjusted to fit their required layout you have the ability to do this yourself without hiring a programmer. Sage has a nice 6 minute vide that showcases the ACH for Accounts Payable. We can install and configure this during your upgrade – and help you manage the first few exports of data to your bank. Of course we have clients who have been doing this for years and we are happy to connect our clients to those already using the enhancement to get direct feedback on their experiences. PS – I noticed after composing this article that I mistakenly pasted in the YouTube from last night’s Lou Gramm concert at Mohegan Sun. The video you want of the ACH for MAS 90 is here. Enjoy Lou Gramm performing Jukebox Hero live at Mohegan Sun 7/23/2010 (former lead singer of Foreigner). Sage Payment Services introduces a new service that just might save you a few trips to the bank. While you are always able to use ACH to electronically transmit or receive payments – the Sage Desktop Deposit offers the ability to process all types of checks drawn on U.S. banks – Personal, Business, Government, Traveler’s, Cashier’s, Certified, Equity Lines of Credit checks and Money Orders. The primary hardware requirement is a 2-sided document scanner (list of compatible devices). The Sage Desktop Deposit meets all the standards established by Check 21 which is the 2004 legislation passed by Congress allowing for scanned check images to substitute for actual paper based checks.